Skin Treatments: Andalou, Burt's Bees, Derma E, Reviva Labs! • Blemish Vanishing Gel: Starts working on contact for clearer skin in four hours, calming inflammation and combating blemishes beneath the surface. Camphor and willow bark extract clear breakouts, as Advanced Fruit Stem Cells effectively speed healing. For Normal to Oily and Troubled Skin. 0.60 oz. ORDER NOW! Active Ingredients: Salicylic Acid 2.0%. Ingredients: Aloe Barbadensis Juice, Aqua, Vegetable Glycerin, Ethyl Alcohol, Hamamelis Virginiana (Witch Hazel), Hydroxyethyl Cellulose, Salix Alba (Willow Bark), Spirae Ulmaria (Meadowsweet) and Epilobium Angustifolium (Willow Herb) Extracts, Malus Domestica (Apple), Solar Vitis (Grape) and Vaccinium Myrtillus (Bilberry) Fruit Stem Cell Cultures and BioActive 8 Berry Complex, Magnesium Ascorbyl Phosphate (Vitamin C), Zinc Gluconate, Camellia Sinensis (White Tea) Extract, Ubiquinone (CoQ10), Tocopherol (Vitamin E), Arnica Montana, Lavandula Officinalis (Lavender), Chamomilla Recutita (Chamomile) and Calendula Officinalis Extracts, Cinnamomum Camphora (Camphor), Mentha Piperita (Peppermint) & Thymus Vulgaris (Thyme) Oils. • Meyer Lemon Creamy Cleanser: Advanced Fruit Stem Cells and creamy emollients, rich in enzymes and potent antioxidants, gently diffuse, creating a velvety lather to lift away impurities, as rejuvenating Meyer lemon stimulates circulation for improved tone and texture. For fresh, clean skin and a luminous complexion. For Combination Skin. 6 oz. ORDER NOW! Ingredients: Aloe Barbadensis Juice, Aqua, Decyl Glucoside, Helianthus Annuus (Sunflower) Oil, Manuka Honey, Vegetable Glycerin, Sorbitol, Citrus Medica Limonum (Meyer Lemon) Extract, Simmondsia Chinensis (Jojoba) and Rosa Canina (Rosehip) Oils, Polysorbate 60, Cetearyl Alcohol, Malus Domestica (Apple), Solar Vitis (Grape) and Vaccinium Myrtillus (Bilberry) Fruit Stem Cell Cultures and BioActive 8 Berry Complex, Hippophae Rhamnoides (Sea Buckthorn) Oil, Magnesium Ascorbyl Phosphate (Vitamin C), Grapeseed Polyphenols, Ubiquinone (CoQ10), Allantoin, Tocopherol (Vitamin E), Camellia Sinensis (White Tea) and Hibiscus Rosa-Sinensis Extracts, Vanilla Planifolia and Citrus Aurantium Dulcis (Orange) Extracts, Phenoxythanol, Ethylhexylglycerin, Cananga Odorata (Ylang Ylang) Oil, Styrax Benzoin Resin, Citrus Medica Limonum (Lemon) Oil. • Citrus Kombucha Cleansing Gel: Advanced Fruit Stem Cells, Vitamin C citrus complex, and rejuvenating Kombucha enzymes, boost healthy microflora for improved immunity, creating gentle clarifying foam to effectively neutralize germs and bacteria. For clear pores and a healthy clean complexion. For Normal, Oily Skin. 6 oz. ORDER NOW! Ingredients: Aloe Barbadensis Juice, Aqua, Decyl Glucoside, Sodium Cocoyl Methyl Taurate, Vegetable Glycerin, Sodium PCA, Saccharum Officinarum (Sugar Cane) and Citrus Medica Limonum (Lemon) Juices, Magnesium Ascorbyl Phosphate (Vitamin C), Grapeseed Polyphenols, Ubiquinone (CoQ10), Saccharomyces Xylinum Black Tea Ferment (Kombucha), Malus Domestica (Apple), Solar Vitis (Grape) and Vaccinium Myrtillus (Bilberry) Fruit Stem Cell Cultures and BioActive 8 Berry Complex, Lippia Citriodora (Verbena) Extract, Citric Acid, Tocopherol (Vitamin E), Aspalathus Linearis (Rooibos) Extract, Allantoin, Sodium Benzoate, Potassium Sorbate, Ethylhexylglycerin, Cymbopogon Flexuosus (Lemongrass) and Citrus Aurantifolia (Lime) Oils. • Pumpkin Honey Glycolic Mask: Organic pumpkin, rich in Vitamin A, and glycolic AHA gently dissolve the intra-cellular glue that binds dull surface cells and lifts them away, as Advanced Fruit Stem Cells stimulate circulation and healthy cell renewal for even tone and texture, revealing a fresh complexion. For Normal and Combination Skin. 1.7 oz. ORDER NOW! Ingredients: Cucurbita Pepo (Pumpkin) Puree, Aloe Barbadensis Juice, Aqua, Helianthus Annuus (Sunflower) Oil, Vegetable Glycerin, Manuka Honey, Tocopherol (Vitamin E), Ananas Sativus (Pineapple) Juice, Pectin, Glycolic Acid, Sodium Hyaluronate, Xanthan Gum, Malus Domestica (Apple), Solar Vitis (Grape) and Vaccinium Myrtillus (Bilberry) Fruit Stem Cell Cultures and BioActive 8 Berry Complex, Lecithin, Saccharum Officinarum (Sugar Cane), Calophyllum Tacamahaca (Tamanu) and Limnanthes Alba (Meadowfoam) Oils, Ubiquinone (CoQ10), Magnesium Ascorbyl Phosphate (Vitamin C), Aspalathus Linearis (Rooibos) Extract, Phenoxyethanol, Ethylhexylglycerin, Cinnamomum Cassia (Cinnamon), Myristica Fragrans (Nutmeg), Eugenia Caryophyllus (Clove) and Pimento Officinalis (Allspice) Powders. • Avo Cocoa Skin Food Mask: Advanced Fruit Stem Cells, nourishing organic avocado, rich in Vitamin E, and pure cocoa, abundant in antioxidants and amino acids, effectively slow cellular damage and stimulate healthy cell renewal, replenishing moisture balance and dermal structure for soft, smooth skin. For Normal to Dry and Sensitive Skin. 1.7 oz. ORDER NOW! Ingredients: Aloe Barbadensis Juice, Aqua, Caprylic/Capric Triglyceride, Theobroma Cacao (Cocoa) Powder, Vegetable Glycerin, Cetyl Alcohol, Cetearyl Glucoside, Glyceryl Stearate, Butyrospermum Parkii (Shea) Butter, Persea Gratissima (Avocado) and Cocos Nucifera (Coconut) Oils, Theobroma Cacao (Cocoa) Butter, Xanthan Gum, Sclerotium Gum, Malus Domestica (Apple), Solar Vitis (Grape) and Vaccinium Myrtillus (Bilberry) Fruit Stem Cell Cultures and BioActive 8 Berry Complex, Coffea Arabica (Coffee) Extract, Saccharum Officinarum (Sugar Cane), Tocopherol (Vitamin E), Ubiquinone (CoQ10), Helianthus Annuus (Sunflower) Oil, Magnesium Ascorbyl Phosphate (Vitamin C), Simmondsia Chinensis (Jojoba) Oil, Lecithin, Phenoxyethanol, Ethylhexylglycerin, Camellia Sinensis (White Tea) Extract. • Lemon Sugar Facial Scrub: Advanced Fruit Stem Cells and Vitamin C, blended with enzyme-rich Manuka honey, gently diffuse and lift away impurities, fresh lemon cleans and purifies, as organic sugar gently exfoliates to increase circulation and vitality for a bright, healthy complexion. For Normal to Oily and Troubled Skin. 1.7 oz. ORDER NOW! Ingredients: Saccharum Officinarum (Sugar Cane), Helianthus Annuus (Sunflower) Oil, Aloe Barbadensis Juice, Aqua, Vegetable Glycerin, Cocos Nucifera (Coconut) Oil, Olea Europaea (Olive) Oil, Oleic Acid, Manuka Honey, Bambusa Vulgaris (Bamboo), Citrus Hystrix (Kaffir Lime) and Curcuma Longa (Turmeric) Extracts, Malus Domestica (Apple), Solar Vitis (Grape) and Vaccinium Myrtillus (Bilberry) Fruit Stem Cell Cultures and BioActive 8 Berry Complex, Magnesium Ascorbyl Phosphate (Vitamin C), Camellia Sinensis (White Tea) Extract, Phenoxyethanol, Ethylhexylglycerin, Cananga Odorata (Ylang Ylang) Oil, Styrax Benzoin Resin, Citrus Medica Limonum (Lemon) Oil. • Daily Defense Facial Lotion SPF18: Perfect for sensitive skin, this ultra sheer lotion provides essential moisture with proven UVA/UVB sun protection. Fruit Stem Cells and BioActive 8 Berry Complex diminish photo-aging and stimulate healthy cell renewal for age defying benefits. For all Skin Types. 1.7 oz. ORDER NOW! Active Ingredients: Octinoxate 7.5%, Octisalate 5.0%, Oxybenzone 3.0%. Ingredients: Aloe Barbadensis Juice, Aqua, Vegetable Glycerin, Helianthus Annuus (Sunflower) Oil, Glyceryl Stearate, Octyl Palmitate, Cetearyl Alcohol, Glyceryl Monolaurate, Dipotassium Glycyrrhizinate, Magnesium Ascorbyl Phosphate (Vitamin C), Ubiquinone (CoQ10), Tocopherol (Vitamin E), Malus Domestica (Apple), Solar Vitis (Grape) and Vaccinium Myrtillus (Bilberry) Fruit Stem Cell Cultures and BioActive 8 Berry Complex, Laminaria Digitata (Kelp) and Curcuma Longa (Turmeric) Extracts, Allantoin, Epilobium Angustifolium (Willow Herb) Extract, Chamomilla Recutita (Chamomile) and Calendula Officinalis Extracts, Hyaluronic Acid, Cocos Nucifera (Coconut), Borago Officinalis (Borage) and Rosa Canina (Rosehip) Oils, Camellia Sinensis (White Tea), Aspalathus Linearis (Rooibos), and Hibiscus Rosa-Sinensis Extracts, Phenoxyethanol, Ethylhexylglycerin, Benzyl Alcohol, Citrus Aurantium Dulcis (Orange) and Citrus Tangerina (Tangerine) Oils. • Natural Acne Solutions Maximum Strength Spot Treatment Cream: Bye bye blemishes! Go from blemish to beautiful with this maximum strength spot treatment cream. Dermatologist-tested and clinically proven to help reduce and improve the appearance of blemishes without irritating your skin. Easy to apply, this spot treatment cream is formulated with Licorice Root Extract to help reduce the appearance of redness and Tamanu Oil to help promote healthy skin. A clear, smooth, fantastic face, naturally. Helps soothe and calm irritated skin. Salicylic Acid, derived naturally from Willow Bark, penetrates pores to reduce acne and prevent future breakouts. Non-irritating and non-comedogenic. 0.5 oz. ORDER NOW!. Active Ingredient: Salicylic Acid (2.0%). Inactive Ingredients: Aqua (Water, Eau), Caprylic/Capric Triglyceride, Glycerin, Salix Nigra(Willow) Bark Extract, Stearyl Alcohol, Cetyl Alcohol, Glyceryl Stearate SE, Cera Alba (Beeswax, Cire D'abeille), Calophylluminophyllum Seed Oil, Cymbopogon Schoenanthus Extract, Dipotassium Glycyrrhizate, Equisetum Hiemale Extract, Hamamelis Virginiana (Witch Hazel) Leaf Extract, Humulus Lupulus (Hops) Extract, Hydrastis Canadensis (Goldenseal) Extract, Lonicera Caprifolium Extract, Lonicera Japonica Extract, Simmondsia Chinensis (Jojoba) Seed Oil, Stearic Acid, Sorbic Acid, Tocopherol, Xanthan Gum, Lecithin, Glucose, Glycine Soja (Soybean) Oil, Parfum (Fragrance), Sodium Chloride, Glucose Oxidase, Lactoperoxidase, Phenoxyethenol, Citral, Geraniol, Limonene, Linalool. • Natural Acne Solutions Daily Moisturizing Lotion: Clearly moisturized. This lightweight lotion is clinically proven to help control oil and protect against blemishes without irritating your skin. Designed for acne-prone skin and helps calm irritation with Lemongrass, Witch Hazel, Goldenseal and Hops. Resulting in clear, smooth, healthy looking skin. Naturally. Dermatologist-tested, non-irritating, non-comedogenic. 2 oz. ORDER NOW! Active Ingredient: Salicylic Acid (1.0%), Inactive Ingredients: Water, Helianthus Annuus (Sunflower) Seed Oil, Glycerin, Stearic Acid, Sucrose Distearate, Salix Nigra (Willow) Bark Extract, Sucrose Stearate, Cymbopogon Schoenanthus (Lemongrass) Extract, Hamamelis Virginiana (Witch Hazel) Water, Humulus Lupulus (Hops) Extract, Equisetum Hiemale (Horsetail) Leaf Extract, Hydrastis Canadensis (Golden Seal) Extract, Epilobium Fleischeri (Gravel Willow) Extract, Lecithin, Chrondrus Crispus (Carrageenan) Extract, Fragrance, Glucose, Xanthan Gum, Sodium Borate, Sodium Chloride, Glucose Oxidase, Lactoperoxidase. • Natural Acne Solutions Purifying Gel Cleanser: From cleanser to clearer. Purifying Gel Cleanser is clinically proven to help wash away acne-causing bacteria, excess oil and impurities without over-drying or irritating skin. Salicylic Acid, derived naturally from Willow Bark Extract, penetrates pores to help reduce acne and prevent future breakouts while Evening Primrose and Beet Root Extracts help calm acne prone skin. The result is naturally clear and healthy-looking skin. Dermatologist-tested, non-irritating, non-comedogenic. 2 oz. ORDER NOW! Active Ingredient: Salicylic Acid (1.0%), Inactive Ingredients: Water, Decyl Glucoside, Lauryl Glucoside, Sucrose Laurate, Salix Nigra (Willow) Bark Extract, Coco-Betaine, Betaine, Beta Vulgaris (Beet) Root Extract, Oenothera Biennis (Evening Primrose) Leaf Extract, Sodium Cocoyl Hydrolyzed Soy Protein, Hydroxypropyltrimonium Honey, Glycerin, Glyceryl Oleate, Coco-Glucoside, Fragrance, Glucose, Alcohol Denat., Glucose Oxidase, Lactoperoxidase, Citric Acid, Sodium Chloride, Phenoxyethanol. • Natural Acne Solutions Clarifying Toner: Clean skin clarified. Formulated with skin clarifying Witch Hazel and Lemongrass, known for its astringent properties, this toner removes lingering traces of cleanser, dirt, oil and make-up. Designed for acne-prone skin. It also has Salicylic Acid, derived naturally from Willow Bark Extract, to penetrate pores, reduce acne and prevent future breakouts. The result is naturally clear, healthy-looking skin. Dermatologist-tested, non-irritating, non-comedogenic. 5 oz. ORDER NOW! • Natural Acne Solutions Pore Refining Scrub: Clearer skin is just a scrub away. This deep cleansing scrub is clinically proven to exfoliate dead skin cells while refining the appearance of pores without over-drying or irritating skin. Designed for acne-prone skin. Salicylic Acid, derived naturally from Willow Bark Extract, penetrates deep into pores to help reduce acne and prevent future breakouts. Formulated with Jojoba Beads and a natural fruit acid complex, this scrub gently exfoliates. Giving you refined, clear and smooth skin. Dermatologist-tested, non-irritating, non-comedogenic. 2 oz. ORDER NOW! Active Ingredient: Salicylic Acid (1.0%), Inactive Ingredients: Water, Vitis Vinifera (Grape) Seed Oil, Stearic Acid, Glycerin, Hydrogenated Jojoba Oil, Salix Nigra (Willow) Bark Extract, Cocos Nucifera (Coconut Oil), Sodium Borate, Fragrance, Vaccinium Myrtillus (Bilberry) Extract, Saccharum Officinarum (Sugar Cane) Extract, Citrus Aurantium Dulcis (Orange) Fruit Extract, Citrus Medica Limonum (Lemon) Fruit Extract, Acer Saccharum (Sugar Maple) Extract, Sucrose Stearate, Xanthan Gum, Glucose, Sodium Chloride, Glucose Oxidase, Lactoperoxidase. • Natural Acne Solutions Targeted Spot Treatment: Hit the target for clearer skin.Targeted Spot Treatment is clinically proven to help reduce and improve the appearance of blemishes in 48 hours without irritating skin. Formulated with Tea Tree, Calendula, Yarrow, and Parsley Extracts, it helps calm and reduce redness while Borage Extract promotes healthy skin. Resulting in clear, smooth skin. Naturally. Dermatologist-tested, non-irritating, non-comedogenic. 0.26 oz. ORDER NOW! Active Ingredient: Salicylic Acid (0.75%) Inactive Ingredients: Alcohol Denat., Citrus Medica Limonum (Lemon) Peel Oil, Water, Calendula Officinalis Flower Extract, Achillea Millefolium (Yarrow) Extract, Borago Officinalis (Borage) Extract, Carum Petroselinum (Parsley) Extract, Foeniculum Vulgare (Fennel) Fruit Oil, Salix Nigra (Willow) Bark Extract, Melaleuca Alternifolia (Tea Tree) Leaf Oil, Eucalyptus Globulus Leaf Oil, Juniperus Communis Fruit Oil. • Natural Acne Solutions Regimen Kit: Put your best face forward! Cleanse, moisturize, and target blemishes with our 3-step acne regimen. Natural Acne Solutions™ products are the only truly natural* acne solution clinically proven to reduce and prevent acne. This 3-step regimen kit is dermatologist tested and won’t irritate skin or clog pores. It contains a cleanser, moisturizer and spot treatment that are gentle enough to use every day, but incredibly effective, thanks to hard-working willowbark extract. So skip the synthetics and go straight to the natural source. These three natural treatments help keep your skin clear. It's the natural solution to acne. ORDER NOW! (1) Cleanses with Purifying Gel Cleanser, 5 oz. (2) Moisturizes with Daily Moisturizing Lotion, 2 oz. (3)Targets blemishes with Targeted Spot Treatment, 0.26 oz. Spot Treatment Cream Maximum Strength, 0.5 oz. WOMEN'S HEALTH/SKIN TREATMENTS: Daily Moisturizing Lotion, 2 oz. WOMEN'S HEALTH/SKIN TREATMENTS: Natural Acne Solutions Regimen Kit, 3 pc. • Honey & Shea Body Butter: Serious smoothing for every body. You're pretty amazing, so it only makes sense your skin should be too. That's why we created our crave-worthy body butter. It moisturizes and conditions your skin with a naturally decadent blend of softening Honey and antioxidant-rich Sweet Almond Oil combined with nourishing Shea Butter. Resulting in your skin feeling happily hydrated and conditioned silky smooth. It's the body butter born to be beautiful. 6.5 oz. ORDER NOW! • Mama Bee Belly Butter: Treat yourself with the extra rich Mama Bee Belly Butter specially combined to nurture and hydrateskin during your nine month stretch. Natural fragrance-free formula contains a blend of Cocoa, Shea and Jojoba Butters that will keep your belly feeling soft and smooth before and after your new arrival. No phthalates, parabens, petrolatum, or SLS. 6.5 oz. ORDER NOW! Ingredients: Aqua (Water, Eau), Helianthus Annuus (Sunflower) Seed Oil, Glycerin, Cocos Nucifera (Coconut) Oil, Cetyl Alcohol, Prunus Amygdalus Dulcis (Sweet Almond) Oil, Sucrose Stearate, Butyrospermum Parkii (Shea) Butter, Glyceryl Laurateglycine Soja (Soybean) Oil, Lactic Acid, Magnesium Aluminum Silicate, Simmondsia Chinensis (Jojoba) Butter, Sodium Stearoyl Lactylate, Sucrose Polystearate, Theobroma Cacao (Cocoa) Seed Butter, Tocopherol, Xanthan Gum, Phenoxyethanol. • Cranberry & Pomegranate Sugar Scrub: Exfoliating crystals blended with Pomegranate Oil, Cranberry Seed, and Shea Butter in Cranberry & Pomegranate Sugar Scrub to gently polish and condition your skin. Leaving it feeling healthy, smooth and beautifully glowing. Sweet fragrance. 8 oz. ORDER NOW! Ingredients: Sucrose, Glycine Soja (Soybean) Oil, Crambe Abyssinica Seed Oil, Silica, Zea Mays (Corn) Starch, Olea Europaea (Olive) Fruit Oil, Helianthus Annuus (Sunflower) Seed Oil, Cocos Nucifera (Coconut) Oil, Vitis Vinifera (Grape) Seed Oil, Butyrospermum Parkii (Shea) Butter, Parfum (Fragrance), Vaccinium Macrocarpon (Cranberry) Seed, Vaccinium Macrocarpon (Cranberry) Fruit Juice, Punica Granatum Seed Oil, Vaccinium Macrocarpon (Cranberry) Fruit Powder, Mel (Honey, Miel), Hydrolyzed Soy Protein, Tocopherol, Aqua (Water, Eau), Magnesium Hydroxide, Citric Acid, Limonene, Geraniol Natural Fragrance/Parfum Naturel. • Peach & Willowbark Deep Pore Scrub: Peach & Willow Bark Deep Pore Scrub is made with Willow Bark Extract to help deep clean pores and gently exfoliates to remove dead skin cells, and finely ground Peach Stone helps polish for a smooth complexion. Peach & Willow Bark Deep Pore Scrub removes dirt and excess oil, leaving you with a refreshingly clean feel and naturally healthy-looking skin. 4 oz. ORDER NOW! Ingredients: Water, Vitis Vinifera (Grape) Seed Oil, Stearic Acid, Glycerin, Prunus Persica (Peach) Seed Powder, Cocos Nucifera (Coconut) Oil, Sodium Borate, Fragrance, Salix Nigra (Willow) Bark Extract, Glucose, Anthemis Nobilis (Chamomile) Flower Extract, Hydrastis Canadensis (Golden Seal) Extract, Zingiber Officinale (Ginger) Root Extract, Fucus Vesiculosus (Bladderwrack) Extract, Xanthan Gum, Sucrose Stearate, Glucose Oxidase, Lactoperoxidasel. WOMEN'S HEALTH/SKIN TREATMENTS: Honey & Shea Body Butter, 6.5 oz. • Sensitive Daily Moisturizing Cream: More moisture. Less sensitive. Clinically proven to moisturize sensitive skin all day without causing redness or irritation, this nourishing day cream is formulated with softening Cotton Extract to help skin replenish its outer layer and minimize the effects of potential irritants such as harsh soaps or cleansers. All while Rice Extract moisturizes and Aloe soothes your skin. Naturally gentle for daily use, Sensitive Daily Moisturizing Cream is what your sensitive skin has been waiting for. Does not cause redness or irritation. Fragrance-free and hypo-allergenic. Allergy-tested and dermatologist-tested. 1.8 oz. ORDER NOW! • Sensitive Night Cream: Goodnight sensitive skin. This rejuvenating night cream is clinically proven to moisturize sensitive skin overnight without causing redness or irritation. Specifically formulated with softening Cotton Extract to help skin replenish its outer layer and minimize the effects of potential irritants such as harsh soaps or cleansers, it also has Rice Extract to moisturize and Aloe to soothe and calm. Naturally kind and gentle, you can use it daily. What could be more sensitive? Fragrance-free and hypo-allergenic. Allergy-tested and dermatologist-tested. 1.8 oz. ORDER NOW! Ingredients: Aqua (Water, Eau), Helianthus Annuus (Sunflower) Seed Oil, Glycerin, Cetyl Alcohol, CI 77947 (Zinc Oxide), Zea Mays (Corn) Starch, Gossypium Herbaceum (Cotton) Flower Extract, Oryza Sativa (Rice) Extract, Kaolin, Aloe Barbadensis Leaf Juice, Sucrose, Butyrospermum Parkii (Shea) Butter, Artemisia Umbelliformis Extract, Jojoba Esters, Beta Vulgaris (Beet, Extrait De Racine De Betterave) Root Extract, Lecithin, Saccharum Officinarum (Sugar Cane, Extrait De Canne A Sucre) Extract, Hydrolyzed Jojoba Esters, Fructose, Euphrasia Officinalis Extract, Citric Acid, Xanthan Gum, Glucose, Potassium Sorbate, Alcohol Denat., Sucrose Polystearate, Inositol, Trehalose, Sucrose Stearate, Benzoic Acid, Phenoxyethanol, Sodium Stearoyl Lactylate, Glyceryl Laurate, Sodium Benzoate, Sodium PCA. • Sensitive Eye Cream: We see something calming. Clinically proven to moisturize the delicate eye area without causing redness or irritation, this lightweight eye cream helps reduce the appearance of under-eye puffiness. Formulated with softening Cotton Extract, Sensitive Eye Cream helps skin replenish its outer layer and minimize the effects of potential irritants such as harsh soaps or cleansers while Rice Extract moisturizes and Aloe soothes. Infused with White Genepi Extract, an ingredient known for its anti-inflammatory properties and Eyebright, which contains tannins that are thought to decrease inflammation. Best of all, it's naturally gentle and skin-friendly, so you can use it every day. Giving your sensitive skin the daily care it deserves. All day formula. Fragrance-free and hypo-allergenic. Allergy-tested and dermatologist-tested. 0.5 oz. ORDER NOW! • Sensitive Facial Cleanser: Face anything. This soap-free cream cleanser is clinically proven to moisturize sensitive skin while gently cleansing away dirt, oil and make-up without over drying or causing redness. Distinctly formulated with softening Cotton Extract to help skin replenish its outer layer and minimize the effects of potential irritants such as harsh soaps or cleansers, it also moisturizes with Rice Extract and soothes with Aloe. Formulated with Quillaja and Yucca Extracts to help remove impurities without stripping essential moisture. Naturally gentle and skin-friendly for daily use, it's what every sensitive product should be. Fragrance-free and hypo-allergenic. Allergy-tested and dermatologist-tested. 6 oz. ORDER NOW! Ingredients: Aqua (Water, Eau), Helianthus Annuus (Sunflower) Seed Oil, Glycerin, Cetyl Alcohol, Cera Alba (Beeswax, Cire D'abeille), Sucrose Stearate, Cetearyl Alcohol, Cocos Nucifera (Coconut) Oil, Gossypium Herbaceum (Cotton) Flower Extract, Oryza Sativa (Rice) Extract, Beta Vulgaris (Beet, Extrait De Racine De Betterave) Root Extract, Quillaja Saponaria Bark Extract, Theobroma Cacao (Cocoa) Seed Butter, Yucca Schidigera Leaf/Root/Stem Extract, Artemisia Umbelliformis Extract, Euphrasia Officinalis Extract, Hamamelis Virginiana (Witch Hazel) Water, Saccharum Officinarum (Sugar Cane, Extrait De Canne À Sucre) Extract, Aloe Barbadensis Leaf Juice, Silica, Sucrose, Fructose, Glucose, Coco-Glucoside, Inositol, Maltodextrin, Citric Acid, Benzoic Acid, Trehalose, Xanthan Gum, Potassium Sorbate, Sodium Benzoate, CI 77947 (Zinc Oxide), Alcohol Denat., Phenoxyethanol. • Fragrance Free Shea Butter & Vitamin E Body Lotion: Fragrance-free for you and me. Shea Butter & Vitamin E Body Lotion is a non-greasy, hypo-allergenic formula gives all skin types (you too, sensitive skin sufferers!) the nourishment they need without all the irritation. Dermatologist-tested and clinically proven to moisturize for up to 24 hours, this special blend marries hydrating Shea Butter and Vitamin E with natural botanicals like Chamomile, Calendula, St. John's Wort, Rosemary and Linden Flower. Plus, it's fragrance free, so you can stop and not have to smell like a bed of roses! 100% natural fragrance. Non-greasy, hypo-allergenic, fragrance free formula. 12 oz. ORDER NOW! Shea Butter & Vitamin E Body Lotion Fragrance Free, 12 oz. WOMEN'S HEALTH/SKIN TREATMENTS: Sensitive Facial Cleanser, 6.oz. • Brightening Dark Spot Corrector: Clinically proven Brightening Dark Spot Corrector helps noticeably reduce the appearance of dark spots and discoloration. Helps create a brighter, more luminous complexion, and evens skin tone. Make Brightening Dark Spot Corrector a part of your daily regimen for a brighter and more even complexion, naturally. Dermatologist Tested. Noncomedogenic. 1.8 oz. ORDER NOW! Ingredients: Aqua (Water, Eau), Glycerin, Aloe Barbadensis Leaf Juice, Bellis Perennis (Daisy) Flower Extract, Malva Sylvestris (Mallow) Leaf Extract, Mentha Piperita (Peppermint) Leaf Extract, Primula Veris Extract, Alchemilla Vulgaris Extract, Veronica Officinalis Extract, Melissa Officinalis Leaf Extract, Achillea Millefolium Extract, Vaccinium Myrtillus Fruit Extract, Citrus Medica Limonum (Lemon) Fruit Extract, Citrus Aurantium Dulcis (Orange) Fruit Extract, Saccharum Officinarum (Sugar Cane, Extrait De Canne Á Sucre) Extract, Acer Saccharum (Sugar Maple) Extract, Lactobacillus/Dipteryx Odorata Seed Ferment Filtrate, Leuconostoc/Radish Root Ferment Filtrate, Amorphophallus Konjac Root Powder, Leucojum Aestivum Bulb Extract, Aloe Barbadensis Leaf Extract, Chondrus Crispus (Carrageenan), Emblica Officinalis Fruit Powder, Caprylyl/Capryl Wheat Bran/Straw Glycosides, Fusel Wheat Bran/Straw Glycosides, Maltodextrin, Arginine, Alcohol Denat., Alcohol, Phenethyl Alcohol, Sucrose, Parfum (Fragrance), Polyglyceryl-5 Oleate, Sodium Cocoyl Glutamate, Sodium Stearoyl Lactylate, Glyceryl Laurate, Glyceryl Caprylate, Sodium Benzoate, Potassium Sorbate, Phenoxyethanol, Citral, Geraniol, Limonene, Linalool. • Intense Hydration Treatment Mask: Intense Hydration Treatment Mask provides your dry skin the gift of hydration for a natural anti-aging solution. Made with Clary Sage offers instant deep hydration and help increase skin's ability to retain moisture. Helps reduce the appearance of fine lines and wrinkles, leaves skin soft and supple. Dermatologist Tested and Noncomedogenic. 4 oz. ORDER NOW! Ingredients: Aqua (Water, Eau), Ricinus Communis (Castor) Seed Oil, Glycerin, Cetyl Alcohol, Stearyl Alcohol, Cocos Nucifera (Coconut) Oil, Glyceryl Stearate, Parfum (Fragrance), Propanediol, Salvia Sclarea (Clary) Extract, Lactobacillusastrocaryum Tucuma Seed Butter, Trichilia Emetica Seed Butter, Cera Alba (Beeswax, Cire D'abeille), Citrus Aurantium Amara (Bitter Orange) Peel, Polymnia Sonchifolia Root Juice, Helianthus Annuus (Sunflower) Seed Wax Lecithin, Alpha-Glucan Oligosaccharide, Maltodextrin, Tocopherol, Xanthan Gum, Glycine Soja (Soybean) Oil, Stearic Acid, Sodium PCA, Zinc PCA, Potassium Stearate, Potassium Sorbate, Sodium Benzoate, Phenoxyethanol Amyl Cinnamal, Eugenol, Hydroxycitronellal, Linalool. • Facial Cleansing Oil w/Coconut & Argan Oils: 100% natural, Facial Cleansing Oil helps cleanse and refresh all at once without leaving an oily residue. Lightweight, skin-nurturing botanicals like Coconut and Argan Oils remove dirt and makeup without leaving a sticky residue or stripping away skin's naturally protective barriers. Leaves skin soft, smooth, and feeling moisturized. Dermatologist Tested, Ophthalmologist Tested and Noncomedogenic. 6 oz. ORDER NOW! Ingredient: Caprylic/Capric Triglyceride, Crambe Abyssinica Seed Oil, Isoamyl Laurate, Polyglyceryl-2 Sesquioleate, Fragrance, Polyglyceryl-2 Caprate, Argania Spinosa Kernel Oil, Cocos Nucifera (Coconut) Oil, Helianthus Annuus (Sunflower) Seed Oil, Rosmarinus Officinalis (Rosemary) Leaf Extract, Tocopherol. • Garden Tomato Toner: Natural facial Garden Tomato Toner is combined of Tomato, Cucumber and Parsley Extracts to help remove dirt, oil and make-up and tightens pores for fresh, beautiful skin. Made with a Fruit Acid Complex featuring Sugar Cane, Sugar Maple, and Bilberry Extracts rich in Alpha Hydroxy Acids supports natural exfoliation of dead skin cells. Garden Tomato Toner helps to prepare your skin to maximize the benefits of your moisturizer. 8 oz. ORDER NOW! • Herbal Blemish Stick: All-natural Herbal Blemish Stick contains 10 herbal ingredients including Tea Tree and Juniper Oils, known for their astringent qualities. Made with Willow Bark helps to gently exfoliate your skin for a clear skin. 0.26 oz. ORDER NOW! Ingredients: Alcohol Denat., Calendula Officinalis Flower Oil, Borago Officinalis (Borage) Seed Oil, Achillea Millefolium (Yarrow) Oil, Carum Petroselinum (Parsley) Seed Oil, Salix Nigra (Willow) Bark Extract, Citrus Medica Limonum (Lemon) Peel Oilfoeniculum Vulgare (Fennel) Oil, Water, Melaleuca Alternifolia (Tea Tree) Leaf Oil, Juniperus Communis (Juniper) Fruit Oil, Eucalyptus Globulus (Eucalyptus) Leaf Oil. Garden Tomato Toner, 8 oz. WOMEN'S HEALTH/SKIN TREATMENTS: Brightening Dark Spot Corrector, 1.8 oz. Facial Cleansing Oil w/Coconut & Argan Oils, 6 oz. WOMEN'S HEALTH/SKIN TREATMENTS: Herbal Blemish Stick, 0.26 oz. • Hand Salve: Salvation for rough, dry hands. Have super-dry hands? This all-natural salve knows how to handle it. Brimming with botanical oils, herbs and Beeswax, your hard-working hands can finally find sweet relief. Moisturizes rough, dry hands with botanical oils and Beeswax. Herbal scent. Perfect for both men and women. 3 oz. ORDER NOW! • Almond Milk Beeswax Hand Creme: Give your hands a hand.Dry hands happen. That's why our super rich, all-natural hand creme has Sweet Almond Oil and Vitamin E to hydrate and shield your hard-working skin. We then top it off with our very favorite skin conditioner, Beeswaxto seal and condition the skin. Nutty almond scent. 2 oz. ORDER NOW! Ingredients: Prunus Amygdalus Dulcis (Sweet Almond) Oil, Water, Beeswax, Aloe Barbadensis Leaf Juice, Kaolin, Fragrance, Citrus Grandis (Grapefruit) Fruit Extract, Tocopherol, Non-Fat Dry Milk, Chondrus Crispus (Carrageenan) Extract, Glycerin, Glycine Soja (Soybean) Oil, Stearic Acid, Glucose, Sodium Borate, Sodium Chloride, Sodium Benzoate, Glucose Oxidase, Lactoperoxidase. • Shea Butter Hand Repair Cream: Shea goodbye to dry hands. Show dry hands the door with this ultra-rich hand cream. Perfect for everyday revival, Shea Butter is the star along with a bouquet of botanical oils including Sesame, Borage, Macadamia, Rosehip and Sunflower. Get soft, beautifully moisturized hands anytime. All the time. 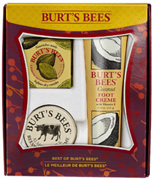 A Burt's Bees customer favorite! 3.2 oz. ORDER NOW! • Ultimate Care Hand Cream: Clinically proven Ultimate Care Hand Cream helps treat dry hands and provide all-day moisture for amazingly soft and smooth hands. Made with Baobab Oil to help hydrate, Watermelon Seed Oil to nurture and natural Fruit Acid Complex to gently exfoliate. Pumpkin Seed Oil and Green Tea Extract help calm skin. Non-greasy formula that absorbs quickly with no added fragrance. Dermatologist Tested and Hypoallergenic. 3.2 oz. ORDER NOW! Ingredient: Aqua (Water, Eau), Glycerin, Cocos Nucifera (Coconut) Oil, Cetyl Alcohol, Helianthus Annuus (Sunflower) Seed Oil, Caprylic/Capric Triglyceride, Adansonia Digitata Oil*, Citrullus Vulgaris (Watermelon) Seed Oil, Cucurbita Pepo (Pumpkin) Seed Oilbuddleja Davidii Leaf Extract, Bisabolol, Cera Alba (Beeswax, Cire D'abeille), Butyrospermum Parkii (Shea) Butter, Simmondsia Chinensis (Jojoba) Butter, Theobroma Grandiflorum Seed Butter, Ricinus Communis (Castor) Seed Oil Aniba Rosaeodora (Rosewood) Wood Extract, Artemisia Umbelliformis Extract, Camellia Sinensis Leaf Extract, Citrus Aurantium Bergamia (Bergamot) Fruit Extract, Citrus Aurantium Dulcis (Orange) Fruit Extract, Citrus Medica Limonum (Lemon) Fruit Extract Coriandrum Sativum (Coriander) Fruit/Leaf Extract, Jasminum Officinale (Jasmine) Flower/Leaf Extract, Lavandula Angustifolia (Lavender) Flower/Leaf/Stem Extract, Cupressus Sempervirens Leaf/Stem Extract, Fucus Vesiculosus Extract Peucedanum Ostruthium Leaf Extract, Saccharum Offic. • Facial Cleansing Towelettes w/ White Tea Extract: Experience Facial Cleansing Towelettes for all skin types. Remove make-up, cleanse and tone in one easy step. Made with vitamin-rich White Tea, soothing Cucumber, and calming Aloe helps treat yourself with make-up remover wipes. Handy, natural Facial Cleansing Towelettes helps remove dirt, oil and make-up without rinsing. Dermatologist-tested and ophthalmologist-tested. FSC Certified, natural fabric. 30 ct. ORDER NOW! Ingredients: Aqua (Water), Aloe Barbadensis Leaf Juice, Glycerin, Camellia Sinensis Leaf Extract, Cucumis Sativus (Cucumber) Fruit Extract, Tocopherol, Citric Acid, Parfum (Fragrance), Xanthan Gum, Polyglyceryl-4 Caprate, Dicaprylyl Carbonatecaprylyl/Caprylpolyglyceryl-4 Caprate, Dicaprylyl Carbonate, Caprylyl/Capryl Glucoside, Glycine Soja (Soybean) Oil, Benzyl Alcohol, Potassium Sorbate, Sodium Benzoate Phenoxyethanol, Amyl Cinnamal, Citral, Citronellol, Limonene, Linalool. WOMEN'S HEALTH/SKIN TREATMENTS: 3.2 oz. Facial Cleansing Towelettes w/ White Tea Extract, 30 ct.
• Best of Burt's Bees Set: Best of Burt's Bees Set is a starter to Burt's Bees or a trio of favorites for a die-hard fan, it's hard to go wrong with this collection of Classics: Coconut Foot Cream, Almond Milk Beeswax Hand Cream, and Lemon Butter Cuticle Cream. And we put it in a new, prettier-than-ever collectible box, so wrapping is practically optional. ORDER NOW! -- Almond Milk Beeswax Hand Cream: Helps hydrate dry hands with Sweet Almond Oil and Vitamin E. Seals and conditions skin with Beeswax. Nutty Almond fragrance. 2 oz. -- Coconut Foot Cream: Helps recover and revitalize dry feet with Coconut Oil, and revives with Rosemary and Peppermint Extract. 4.34 oz. -- Lemon Butter Cuticle Cream: Helps hydrate and softens cuticles with Sweet Almond Oil and Cocoa Seed Butter. Nurtures brittle nails with Vitamin E and Sunflower Oil. Fresh Lemon scent. 0.6 oz. 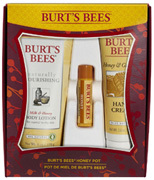 • Burt's Bees Honey Pot Set: Burt's Bees Honey Pot Set helps comfort shopping-weary limbs and cold-sapped lips with nature's sweetest therapy for dryness. Select this softening Burt's Bees Honey Pot Set for thoroughly restorative Honey & Grapeseed Oil Hand Cream, Naturally Nourishing Milk & Honey Body Lotion, and Honey Lip Balm. ORDER NOW! -- Honey & Grapeseed Oil Hand Cream: A daily therapy for dry hands, evens and softens skin with Honey, Jojoba Oil and Rosemary Extract. 2.6 oz. -- Naturally Nourishing Milk & Honey Body Lotion: Clinically proven to hydrate for up to 24 hours and nurture with Milk, Honey, Vitamin E, Coconut and Grape Seed Oils. Non-greasy formula that absorbs quickly. 100% natural fragrance and Dermatologist-tested. 6 oz. -- Honey Lip Balm: Helps nurture dry lips with Honey and Vitamin E. Deliciously sweet Honey flavor. 0.15 oz. 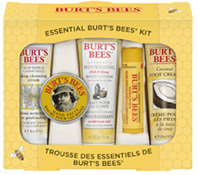 • Essential Burt's Bees Kit: Show how much you care for your friends and family with Essential Burt's Bees Kit, an ideal sampler of ways to love skin more naturally this year. ORDER NOW! -- Soap Bark and Chamomile Deep Cleansing Cream: Helps remove dirt, excess oil and make-up, and intensely washes with Soap Bark. Chamomile and Aloe soften skin, and a hint of Menthol, known for its cooling and calming properties. 0.75 oz. -- Hand Salve: Helps hydrate rough, dry hands with botanical oils and Beeswax. Suitable for both men and women. Herbal scent. 0.30 oz. -- Naturally Nourishing Milk & Honey Lotion: Helps nurture with Milk, Honey, Vitamin E, Coconut and Grape Seed Oils. Clinically proven to hydrate for up to 24 hours, non-greasy formula that absorbs quickly. 100% natural fragrance and Dermatologist-tested. 1.0 oz. -- Coconut Foot Cream: Helps recovers and invigorates dry feet with Coconut Oil. Revives with Rosemary and Peppermint Extracts. 0.75 oz. -- Beeswax Lip Balm: 100% natural way to nurture, moisturize and revitalize lips. 0.15 oz. • Calendula Spray: Calendula Spray is made from the calming Calendula officinalis flower to help support healthy skin care and gently calm dry, irritated, and sensitive skin. This easy-to-use topical Calendula Spray helps to hydrate, nurture, and soothe the skin that has been exposed to harsh elements or conditions. Easy-to-use spray removes the need to rub sensitive skin. Calendula Spray gently soothes dry, sensitive skin for people of all ages—from babies to seniors without being greasy or messy. 8 oz. ORDER TODAY! Ingredients: Purified Water, Glycerin, Calendula Officinalis (Calendula) Extract 40%, Aloe Barbadensis (Aloe Vera) Leaf Juice, Essential Oil Extract, Potassium Sorbate, Centella Asiatica (Gotu Kola) Extract, Matricaria Recutita (Chamomile) Extract and Lactic Acid..
• Magnesium Oil Sport Spray: Magnesium Oil from the Zechstein Sea in the Netherlands delivers highly concentrated pure Magnesium Chloride that is fast acting, non-greasy and easily absorbed. Made with Menthol, Arnica Montana Extract, Eucalyptus Oil, and Peppermint Oil to help calm and hydrate the skin for an active lifestyle. It can be used daily and leaves no unpleasant odor. 8 oz. ORDER TODAY! WOMEN'S HEALTH/SKIN TREATMENTS: Calendula Spray, 8 oz. WOMEN'S HEALTH/SKIN TREATMENTS: Magnesium Oil Sport Spray, 8 oz. • Remedy Roller Ball Focus: Stimulating and refreshing for clarity of mind. Ideal for work or study when clear thinking is needed. Invigorating organic rosemary oil. Energising organic grapefruit oil. Boosting ethically harvested coriander oil. Ideal for work or study, when clear thinking is needed. In neat handbag / cosmetic purse / pocket size. Simply glide over the pulse points - wrists, temples and neck - to benefit from the hand-blended therapeutic oils. 0.33 oz. ORDER TODAY! Ingredients: Simmondsia Chinensis (Jojoba) Oil, Rosmarinus Officinalis (Rosemary) Oil, Citrus Paradisi (Grapefruit) Oil, Parfum, Coriandrum Sativum (Coriander) Seed Oil, Tocopherol, Ascorbyl Palmitate, Helianthus Annuus (Sunflower) Seed Oil, Lecithin, Geraniol, Citronellol, Limonene, Linalool. • Remedy Roller Ball De-Stress: Supportive and comforting to restore peace of mind. Idea for frazzled moments when calm is needed. Soothing organic patchouli oil. Rebalancing organic orange oil. Nurturing ethically harvested rose oil. Ideal for frazzled moments, when calm is needed. In neat handbag / cosmetic purse / pocket size. Simply glide over the pulse points - wrists, temples and neck - to benefit from the hand-blended therapeutic oils. 0.33 oz. ORDER TODAY! Ingredients: Simmondsia Chinensis (Jojoba) Oil, Parfum, Pogostemum Cablin (Patchouli) Oil, Citrus Aurantium Dulcis (Orange) Oil, Rosa Bourbonia (Rose) Oil, Tocopherol, Ascorbyl Palmitate, Helianthus Annuus (Sunflower) Seed Oil, Lecithin, Geraniol, Citronellol, Farnesol, Limonene, Linalool. • Remedy Roller Ball Sweet Dreams: Calming and soothing to promote relaxation. Ideal for restless nights when total switch-off is needed. Tranquil organic lavender oil. Comforting organic bergamot oil. Serene organic ylang-ylang oil. Ideal for restless nights, when total switch-off is needed. In neat handbag / cosmetic purse / pocket size. Simply glide over the pulse points - wrists, temples and neck - to benefit from the hand-blended therapeutic oils. oz. ORDER TODAY! Ingredients: Aqua (Water), Alcohol Denat, Glycerin, Coceth-7, PPG-1-Peg Lauryl Glycol Ether, Lavandula Angustifolia (Lavender) Oil, PEG-40 Hydrogenated Castor Oil, Mentha Piperita (Peppermint) Oil, Aloe Barbadensis (Aloe Vera) Leaf Juice, Cucumis Sativa (Cucumber) Extract, Anthemis Nobilis (Chamomile) Flower Extract, Rosa Damascena (Rose) Flower Oil, Ferula Galbaniflua (Galbanum) Resin Oil, Glyceryl Polyacrylate, Phenoxyethanol, Ethylhexylglycerin, Potassium Sorbate, Sodium Benzoate, Citronellol, Limonene. • Remedy Roller Ball Energize: Ideal for tired moments when stamina is needed. Simply apply to pulse points to restore get-up-and-go. Euphoric organic bergamot oil. Energizing organic grapefruit oil. Uplifting organic lime oil. Ideal for tired moments when stamina is needed. In neat handbag / cosmetic purse / pocket size. Simply apply to pulse points – wrists, temples and neck – to benefit from the hand-blended therapeutic oils. 0.33 oz. ORDER TODAY! Ingredients: Simmondsia Chinensis (Jojoba) Seed Oil, Citrus Aruantium Bergamia (Bergamot) Fruit Oil, Citrus Paradisi (Grapefruit) Peel Oil, Citrus Aurantifolia (Lime) Peel Oil, Coriandrum Sativum (Coriander) Oil, Citrus Aurantium (Orange) Peel Oil, Citrus Aurantium (Petitgrain) Leaf Oil, Cupressus Sempervirens (Cypress) Oil, Juniperus Communis (Juniper) Berry Oil, Tocopherol, Limonene, Linalool, Geraniol, Citral. • Remedy Roller Ball Head Clear: Ideal for head tension when cool release is needed. Simply apply to temples to lighten head overload. Cooling organic white mint oil. Restorative organic lavender oil. Reviving organic lemon oil. Ideal for head tension when cool release is needed. In neat handbag / cosmetic purse / pocket size. Simply apply to temples to benefit from the hand-blended therapeutic oils. 0.33 oz. ORDER TODAY! Ingredients: Simmondsia Chinensis (Jojoba) Seed Oil, Mentha Piperita (White Mint) Oil, Mentha Piperita (Mint) Absolute, Lavandula Angustifolia (Lavender) Oil, Citrus Medica Limonum (Lemon) Peel Oil, Citrus Aurantifolia (Lime) Peel Oil, Origanum Majorana (Marjoram) Oil, Picea Mariana (Black Spruce) Oil, Cymbopogon Citrates (Lemongrass) Oil, Anthemis Nobilis (Chamomile) Flower Oil, Tocopherol, Linalool, Limonene, Geraniol, Citral. WOMEN'S HEALTH/SKIN TREATMENTS: Remedy Roller Ball, 0.33 oz. • Anti Blemish Stick: Tea Tree Anti-Blemish Stick is a spot control stick made with anti-bacterial Tea Tree to fight spots and blackheads. Tea Tree Anti-Blemish Stick intensely cleanse and calm targeted areas of blemish-prone skin. Made with anti-bacterial organic TeaTree oil, protective wild Kanuka Oil and astringent Witch Hazel, formulated in a light gel base for easy application. Tea Tree Anti-Blemish Stick leaves skin is restored, softened and blemishes are reduces and less inflamed. Suitable for frequent use. Perfect cosmetic purse size. Free from parabens and synthetic fragrances. External use only. 0.25 oz. ORDER TODAY! Ingredients: Aqua, Hamamelis Virginia (Witch Hazel) Distillate, Alcohol Denat, PEG-40 Hydrogenated Castor Oil, Melaleuca Alternifolia (Tea-Tree) Oil, Leptospermum Ericoides (Kanuka) Oil, Potassium Carbomer, Allontoin, Phenoxyethanol, Chlorphenesin, Limonene, Linalool. WOMEN'S HEALTH/SKIN TREATMENTS: Anti Blemish Stick, 0.25 oz. • Eczema & Psoriasis Wash and Shampoo: Eczema & Psoriasis Wash is a balanced combination of natural homeopathic remedies, herbal extracts and essential oils for the treatment of Eczema and Psoriasis. 2-in-1 Body Wash & Shampoo helps relieve skin irritation, itching, flaking and dryness. Suitable for children. External use only. 7 oz. ORDER TODAY! Active Ingredients: Borax (20x HPUS 0.2%(Eczema & Psoriasis Relief)), Graphites (6x HPUS 0.2% (Eczema & Psoriasis Relief)), Kalium Sulphuricum (3x HPUS 0.2% (Eczema & Psoriasis Relief)), Natrum Muriatcum (12x HPUS 0.2%(Eczema & Psoriasis Relief)). Inactive Ingredients: Water, PEG 150 Distearate, Lauryl Glucoside, Coco Glucoside, Polysorbate 20, Cocamidopropyl Betaine, Calendula (Calendula Officinalis) Flower Extract, Chamomilla Recutita (Matricaria) Flower Extract, Lavandula Angustifolia (Lavender) Oil, Bergamot (Citrus Aurantium Bergamia) Oil, Diazolidinyl Urea, Phenoxyethanol, Aloe Vera (Aloe Barbadensis) Gel, Santalum Album (Sandalwood) Oil. Eczema & Psoriasis Wash and Shampoo, 7 oz. • Very Clear Acne Cleanser: Daily Very Clear Acne Cleanser helps to gently remove built-up oil and debris, unclog pores, clear up skin, and reduce redness and irritation. Made with Tea Tree, Willow Bark, Rosewood, Lavender and Chamomile helps to be effective on blemish-prone skin, helps provide natural antibacterial and antiseptic properties leaving skin cleaner, vibrant and healthier. Regular use will help balance your complexion and your skin's own oil producing capabilities to help minimize the occurrence of breakouts. Will not leave a residue or irritate the skin. 6 oz. ORDER TODAY! Active Ingredient: Salicylic Acid 2.0%. Inactive Ingredients: Purified Water (Aqua), Disodium Laureth Sulfosuccinate, Cocamidopropyl Hydroxysultaine, Cocamidopropylamine Oxide, PEG-150 Distearate, Polysorbate 20, Glycerin, Melaleuca Alternifolia (Tea Tree) Leaf Oil, Lavandula Officinalis (Lavender) Oil, Aniba Rosaeodora (Rosewood) Oil, Salix Alba (White Willow) Bark Extract, Organic Chamomilla Recutita (Matricaria) Flower Extract* (.5%), Decyl Glucoside, Potassium Sorbate, Phenoxyethanol, Ethylhexylglycerin. • Very Clear Acne Spot Treatment: Concentrated Very Clear Acne Spot Treatment helps treat specific areas of flare-up, and reduce redness and irritation with this. Made with Tea Tree, Willow Bark, Rosewood, Lavender and Chamomile offers natural antibacterial and antiseptic properties to help clear the complexion and prevent blemishes, and reduce redness and sensitivity. May be used whenever breakouts occur to comfort and calm red, irritated skin. Will not leave a residue, dry out or irritate skin. 0.5 oz. ORDER TODAY! Active Ingredients: Salicylic Acid (2%). Inactive Ingredients: Purified Water (Aqua), Hydroxypropyl Starch Phosphate, Propanediol, Glycerin, Decyl Glucoside, Melaleuca Alternifolia (Tea Tree) Leaf Oil, Hamamelis Virginiana (Witch Hazel) Extract, Salix Alba (White Willow) Bark Extract, Organic Aloe Barbadensis Leaf Extract* (.5%), Organic Chamomilla Recutita (Matricaria) Flower Extract (.1%), Panthenol (Provitamin B5), Lavandula Angustifolia (Lavender) Oil, Aniba Rosaeodora (Rosewood) Oil, Allantoin, Glyceryl Stearate, Glyceryl Stearate Citrate, Xanthan Gum, Phenoxyethanol, Ethylhexylglycerin. • Very Clear Moisturizer: Skin-balancing, Very Clear Moisturizer helps clear and prevent breakouts, and diminish redness and irritation day or night. Oily, blemish-prone skin requires extra help balancing skin oils and replenishing nutrients for clear, healthy looking skin. Made with Tea Tree, Willow Bark, Rosewood, Lavender and Chamomile to provide natural antibacterial and antiseptic properties, encouraging healthy, smooth and clearer skin. Regular use can help stabilize your complexion and your skin's own oil producing capabilities to minimize the occurrence of breakouts. Gentle Very Clear Moisturizer helps rebalance skin for a softer, smoother, more normalized complexion. 2 oz. ORDER TODAY! Ingredients: Purified Water (Aqua), Glycerin, Stearic Acid, Cetyl Alcohol, Melaleuca Alternifolia (Tea Tree) Leaf Oil, Caprylic/Capric Triglyceride, Salicylic Acid, Glyceryl Stearate, Salix Alba (White Willow) Bark Extract, Lavandula Officinalis (Lavender) Essential Oil, Aniba Rosaeodora (Rosewood) Wood Oil, Organic Simmondsia Chinensis (Jojoba) Seed Oil (.1%), Organic Chamomilla Recutita (Matricaria) Flower Extract (.1%), Organic Aloe Barbadenisis Leaf Extract (.1%), Allantoin, Xanthan Gum, Potassium Sorbate, Glyceryl Stearate SE, Polysorbate 20, Phenoxyethanol, Ethylhexylglycerin. Very Clear Acne Cleanser, 6 oz. WOMEN'S HEALTH/SKIN TREATMENTS: Very Clear Acne Cleanser, 6 oz. WOMEN'S HEALTH/SKIN TREATMENTS: Very Clear Acne Spot Treatment, 0.5 oz. 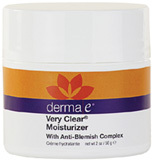 WOMEN'S HEALTH/SKIN TREATMENTS: Very Clear Moisturizer, 2 oz. • Psorzema Creme: This deeply moisturizing crème safely and effectively relieves scaly, flaky and itchy dry skin associated with Psoriasis and Eczema. It absorbs easily and gently calms, soothes and helps heal hot, inflamed skin. This product is made with a safe and effective blend of herbal extracts and skin vitamins such as Neem, Burdock, Bearberry, Vitamins A and E to help soften and soothe dry, irritated, scaling skin. It penetrates deeply to help reduce redness and inflammation and heal the skin. This pleasant moisturizing formula does not contain steroids nor any coal or pine tars. 4 oz. ORDER TODAY! Ingredients: Water (Aqua), Caprylic/Capric Triglyceride, Melia Azadirachta (Neem) Leaf Extract, Arctium Lappa (Burdock) Root Extract, Zanthoxylum Zanthoxyloides (Fagara) Bark Extract, Arctostaphylos Uva Ursi (Bearberry) Leaf Extract, Coptis Chinensis (Chinese Golden Thread) Root Extract, Berberis Aquifolium (Barberry) Extract, Glycerin, Stearic Acid, Glyceryl Stearate and Peg-100 Stearate, Tocopheryl Acetate (Vitamin E), Retinyl Palmitate (Vitamin A), Allantoin, Organic Chamomilla Recutita (Matricaria) Flower Extract (.1%), Organic Simmondsia Chinensis (Jojoba) Seed Oil (.1%), Polysorbate, Cetyl Alcohol, Dimethicone, Phenoxyethanol, Ethylhexylglycerin, Potassium Sorbate. Note: Scar Gel is not a concealer or cover up but a treatment that needs four to six months for maximum results. • Clear Vein Creme (Spider Vein/Bruise Solution):This unique formula is safe and effective on any part of the body for helping to eliminate spider veins, capillary redness, disperse bruises, and enhance the healing process. A unique blend of botanicals including Horse Chestnut, Grape Skin Extract, Witch Hazel and Pycnogenol® plus specific vitamins, it also helps relieve inflammation from minor skin irritation and may help reduce the pain and discomfort associated with these conditions. Clear Vein® Crème is suitable for all skin types and does not contain vitamin K (a vitamin that promotes blood clotting) so it is very safe to use. Please allow 4-6 weeks of regular application to see results. After reaching desired effect, apply every 2-3 days to keep spider veins from reappearing. 2 oz. ORDER TODAY! Ingredients: Water (Aqua), Aesculus Hippocastanum (Horse Chestnut) Seed Extract, Hamamelis Virginiana (Witch Hazel) Extract, Vitis Vinifera (Grape) Skin Extract, Quercus Alba (White Oak) Bark Extract, Glycerin, Stearic Acid, Rutin, Ascorbyl Palmitate (C-Ester), Vaccinium Myrtillus (Bilberry) Extract, Organic Simmondsia Chinensis (Jojoba) Seed Oil, Caprylic/Capric Triglyceride, Polysorbate, Dimethicone, Glyceryl Stearate and Peg-100 Stearate, Pinus Pinaster (Pycnogenol®) Bark Extract, Cetyl Alcohol, Stearyl Alcohol, Tocopheryl Acetate (Vitamin E), Organic Camellia Sinensis (Green Tea) Leaf Extract (.1%), Phenoxyethanol, Ethylhexylglycerin. • Skin Lighten Natural Fade & Age Spot Creme: Skin Lighten Natural Fade & Age Spot Creme uses an exclusive blend of skin-lightening herbs and vitamins to help fade age and liver spots, lighten your complexion, and even out skin tone. Licorice prevents the production of melanin. Alpha-Arbutin helps reduce the activity of Tyrosinase (an enzyme that triggers skin discoloration). Enriched with skin-lightening Vitamin C, vibrancy-boosting Milk Thistle and Ginseng, helps effectively lighten skin. Contains no harmful bleaches or hydroquinone, and may be used to lighten skin on all parts of the body. For maximum effectiveness, wear protective clothing to keep the areas you are trying to lighten out of direct sunlight. As your skin renews itself every 28 days, cells with less melanin will surface during this time, creating a lighter, more even complexion. 2 oz. ORDER TODAY! Ingredients: Water (Aqua), Caprylic/Capric Triglyceride, Stearic Acid, Cetyl Alcohol, Stearyl Alcohol, Glycyrrhiza Glabra (Licorice) Root Extract, Silybum Marianum (Milk Thistle) Extract, Zinc Oxide, Alpha-Arbutin, Ascorbyl Palmitate (C-Ester), Glyceryl Stearate and Peg-100 Stearate, Tocopheryl Acetate (Vitamin E), Retinyl Palmitate (Vitamin A), Panax Ginseng Root Extract, Dimethicone, Phenoxyethanol, Ethylhexylglycerin, Potassium Sorbate. WOMEN'S HEALTH/SKIN TREATMENTS: Clear Vein Creme, 2 oz. Skin Lighten Natural Fade & Age Spot Creme, 2 oz. • Makeup Primer: If you're satisfied with how you look in makeup, wait till you see how good you look with Reviva's NEW MAKEUP PRIMER under your makeup. Use Over Moisturizer Or Directly Under Makeup. Fills in lines, conceals pores, controls excess oil. Helps skin instantly look and feel smooth and silky. Helps makeup foundation last longer. (safe under eye shadow, too). And COQ10 adds protective antioxidant action. 1 oz. ORDER TODAY! Ingredients: Cyclpentasiloxane, dimethicone, Vitamin A Palmitate, Vitamin D3 (Cholecalciferol), Olive Oil, Coenzyme Q10, Squalane. • Varicose Veins Lotion: Aids Circulation --- Helps Strengthen Veins --- Helps Diminish Vein Appearance. Once Varicose veins exist on the legs, they will not improve without treatment. Walking and massage are helpful to move blood out of the veins. Lightly massage legs daily with our new Varicose Veins Lotion not only aids circulation, but can work wonders in helping strengthen veins and diminish their appearance. With vitamin P, plus horse chestnut, grapeseed extract and more.... its the Reviva Labs solution to this very complex skin care problem. Precise dosage and blending make it a one-of-a-kind skin care innovation! 8 oz. ORDER TODAY! Ingredients: Demineralized water, glyceryl stearate, vegetable oil, myristyl stearate, hydrogenated vegetable oil, cetyl alcohol, citrus bioflavonoid complex, vitamin P, sodium ascorbate, lactic acid, polysorbate 20,grape seed extract, horse chestnut extract, soy protein, laneth-10 acetate, methylparaben, propylparaben, xanthan gum, diazolidnyl urea. WOMEN'S HEALTH/SKIN TREATMENTS: Makeup Primer, 1 oz. WOMEN'S HEALTH/SKIN TREATMENTS: Varicose Veins Lotion, 8 oz. • Vitamin K Cream: Primarily to help fade and clear bruises, before or after surgery, "black and blue marks," etc. Also helps treat red, irritated areas on the face, spider veins and rosacea. For all skin types. 1.5 oz. ORDER TODAY! Ingredients:Purified Water, Glyceryl Stearate, Vegetable Oil, Vitamin K, Stearyl Stearate, Lactic Acid, Cetyl Alcohol, Alantoin, Lime Flower Extract, Cetearyl Alcohol, Microcrystalline Cellulose, Methyl & Propyl Paraben. • Collagen Fiber Eye Pads w/ Myoxinal: Decrease eye wrinkles, under-eye dark circles, and puffiness. Immediately visible results and long-term cumulative benefits 100% Collagen Fibre moisturizes, plumps-up surface tissue, Myoxinol relaxes tissue to enhance anti-wrinkle action. Safe BOTOX-like relaxing effect without injections. Ideal for special occasions when a quick improvement is needed. Quickly improve your under-eye area with Collagen-Fibre with Myoxinol Reviva's 100% pure freeze dried Collagen-Fibre Eye Pads by infusing them with Myoxinol. German scientists recently discovered Myoxinol, an extract from the hibiscus flower, is able to relax facial wrinkles providing a BOTOX-like effect. Clinical tests showed a 26% wrinkle reduction after three weeks of treatment. Collagen-Fibre with Myoxinol combines hydration and wrinkle relaxing action. The Collagen instantly plumps and smoothes skin while Myoxinol subdues an underlying cause of wrinkles by relaxing facial muscles for a smoother, younger appearance. Contains: Collagen Fibre Eye Pads (3 pairs). ORDER TODAY! Ingredients: COLLAGEN-FIBRE EYE PADS: 100% Pure Medical Grade Collagen Fibre, Myoxinol (Hibiscus Flower Extract). NOTE: No preservatives are necessary because no bacteria can grow on this freeze-dried pad and because the pad is discarded after one use. • Unscented Moisturizing Body Cream: Exquisitely rich Unscented Moisturizing Body Cream is made from a whipped trio of cold-pressed Cupuaçu, Shea and Mango Butters helps leave your skin soft and smooth, without feeling greasy. Vitamin-rich plant extracts from Broccoli Seed, Borage and Comfrey Root provides nurture to your skin, replenish moisture, and improve elasticity. This is a must-have body lotion for any pregnancy routine! For all skin types. External use only. 4 oz. ORDER TODAY! Ingredients: Water (Aqua), Aloe Barbadensis Leaf Extract, Vitis Vinifera (Grape) Seed Oil, Theobroma Grandiflorum (Cupuaçu) Fruit Extract, Butyrospermum Parkii (Shea) Butter, Glyceryl Stearate (Coconut-derived), Cetearyl Olivate (Olive-derived), Sorbitan Olivate (Olive-derived), Brassica Oleracea Italica (Broccoli) Seed Oil, Glycerin (Coconut-derived), Borago Officinalis (Borage) Seed Oil, Mangifera Indica (Mango) Seed Butter, Tocopherol (Vitamin E), Sodium Hyaluronate, Allantoin (Comfrey Root Extract), Xanthan Gum (Sugar-derived), Guar Gum, Citric Acid, Potassium Sorbate (Rowan Berry-derived), Lonicera Caprifolium (Honeysuckle) Flower Extract, Lonicera Japanica (Honeysuckle) Flower Extract. 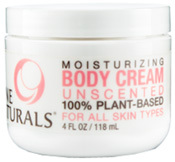 Unscented Moisturizing Body Cream, 4 oz. WOMEN'S HEALTH/SKIN TREATMENTS: Scar Reducing Herbal Cream, 0.75 oz. • Natural Hand Cream Floral Cherrynova: Let the delicate scent of cherry blossoms and almond milk delight your senses while the natural moisturizers soften your digits. Now that deserves a hand. Unabashedly girly-girl fragrance. Softens, silkens and smooths. Hold somebody's hand today. 3 oz. ORDER NOW! Ingredients: Water, Helianthus Annuus (Sunflower) Seed Oil, Glyceryl Stearate, Glycerin, Ceteareth-20, Cetearyl Alcohol, Fragrance, Phenoxyethanol, Tapioca Starch, Butyrospermum Parkii (Shea Butter), Angelica Archangelica Root Extract, Calendula Officinalis Flower Extract, Glycyrrhiza Glabra (Licorice) Root Extract, Lippia Citriodora Leaf Extract, Tocopherol, Plantago Lanceolata Leaf Extract, Xanthan Gum, Glycine Soja (Soybean) Oil, Alcohol Denat., Potassium Sorbate. • Natural Hand Cream Orange Petalooza: Squeeze out a dab. Rub it in. Let the energizing scent of blood orange and hyacinth fill the air and try not to triple-sniff your knuckles. Softens even the roughest hands. Bright, enlivening fragrance. Hold somebody's hand today. 3 oz. ORDER NOW! Ingredient: Water, Helianthus Annuus (Sunflower) Seed Oil, Glyceryl Stearate, Glycerin, Ceteareth-20, Cetearyl Alcohol, Fragrance, Phenoxyethanol, Tapioca Starch, Butyrospermum Parkii (Shea Butter), Angelica Archangelica Root Extract, Calendula Officinalis Flower Extract, Glycyrrhiza Glabra (Licorice) Root Extract, Lippia Citriodora Leaf Extract, Tocopherol, Plantago Lanceolata Leaf Extract, Xanthan Gum, Glycine Soja (Soybean) Oil, Alcohol Denat., Potassium Sorbate. • Natural Hand Cream Vanilla Flame: For super soft hands, seductively scented with vanilla and creamy rice milk. And fingertips that would look perfect wrapped around a silk fan. Sophistication in every creamy application. Banishes even the driest spots. 3 oz. ORDER NOW! WOMEN'S HEALTH/SKIN TREATMENTS: Natural Hand Cream, 3 oz. • Aloe Gel Skin Relief: Formulated with active Aloe Vera extract and 10% polysaccharide content. Helps rehydrate dry skin and forms a protective barrier that keeps skin soft and supple. Combined with our Premium Aloe Extract and the essential herbs known to promote youthful-looking skin and to support the healing process for skin suffering from sunburn, windburn, dryness, itching, minor burns, skin irritations, and chaffing. 6 oz. ORDER TODAY! • Ditch The Itch Cream: Temporarily protects and helps to relieve minor skin irritations and itching due to rashes, eczema, insect bites, poison ivy, oak, sumac. For external use only. 2 oz. ORDER TODAY! Active Ingredient: Colloidal Oatmeal USP 0.1%. Inactive Ingredients Aloe Barbadensis Leaf Extract, Allantoin, Bisabolol, Butyro- spermum (Shea Butter), Caprylyl Glycol, Caprylic/Capric Triglyceride, Cetyl Alcohol, Ceteareth-20, Dimethicone, Eucalyptus Globulus Leaf Oil, Glycerin, 1,2 Hexnediol, Kaolin Clay, Melaleuca Alternifolia (Tea Tree) Leaf Oil, Neem Oil, Steareth-2, Topical Starch (Cornstarch), Water, Xanthan Gum Zinc Oxide. • Poison Ivy/Oak Cream: Dries the oozing and weeping of poison ivy, oak and sumac. For external use only. 2 oz. ORDER TODAY! Active Ingredient: Kaolin Clay 4%, Zinc Oxide (Z-Cote) 1%. Inactive Ingredients: Aloe Barbadensis Leaf Extract, Allantoin, Bisabolol, Butyrospermum (Shea Butter), Caprylyr Glycol, Caprylic/Capric Trglycerides, Cetyl Alcohol, Ceteareth-20, Colloidal Oatmeal USP, Dimethicone, Eucalyptus Globulus Leaf Oil, Glycerin, 1,2 Hexanediol Melaleuca Alternifolia (Tea Tree) Leaf Oil, Neem Oil, Steareth-2, Topical Starch (cornstarch) Water, Xanthan Gum. WOMEN'S HEALTH/SKIN TREATMENTS: Peppermint Thyme Foot Cream, 2 oz. WOMEN'S HEALTH/SKIN TREATMENTS: Look No X E Ma Cream, 2 oz.